IG reported that during 1 January-24 August seismicity at Cotopaxi remained low. Small, intermittent gas emissions mostly stayed near the crater rim and on rare occasions rose no higher than 500 m above the rim. Emissions drifted down the W flank and remobilized ash deposits which were sometimes reported by Parque Nacional Cotopaxi visitors. Historically, Cotopaxi has been an active, dangerous volcano, although it had been mostly quiet for the previous 70 years before beginning a new eruptive period during August-November 2015 (figure 2). Increased seismic activity, deformation, ash plumes and ashfall, SO2 emissions, fumarolic activity, and lahars were all observed by geoscientists from the Geophysical Institute of Ecuador (IG) during the 2015 eruptive phase; information in this report comes from IG unless otherwise noted. Figure 2. Cotopaxi volcano, 21 September 2015. View is towards the south; the plume is rising 1.5 km above the summit and drifting WSW. Photo by B. Bernard, courtesy of IG. The first phreatic explosions took place on 14 August 2015 and spread ash across the region up to 48 km NW, followed by a pyroclastic flow on the W flank the next morning. The first eruptive phase with numerous explosions and high seismicity continued through mid-September. A shorter explosive episode occurred in October, and the last significant ashfall was in late November. The Cotopaxi National Park was reopened to visitors in late December, as both seismic and surficial activity had declined significantly. The last ash emission was reported on 24 January 2016. The first rain-induced lahar occurred in late August, and numerous others were recorded in November 2015 and February 2016. Pre-eruption activity. During 2002 and 2003, observations of increased seismicity included a large number of fracture-related volcano-tectonic (VT) events located between 1 and 15 km below the summit accompanied by fumarolic activity and occasional steam plumes (BGVN 28:12). In spite of this heightened activity, no ash-bearing emissions were detected. From July through early September 2005, the number of VT earthquakes within a 15-km radius of the summit again increased from background levels, but none were large enough to be felt nearby. These earthquakes had a maximum magnitude of M 4.4, and ranged from 3 to 10 km below the summit. IG scientists interpreted this increased seismic activity, characterized by long-period (LP) and hybrid (HB) earthquakes, to be related to fluid mobilization. The level and magnitude of activity was similar to that which occurred during the November 2001-January 2002 period. This increase in seismicity was also shown to correlate with elevated fumarolic activity as witnessed from a video camera installed on the NW edge of the crater. Again, no ash-bearing emissions were detected. From late 2005 through early 2015 Cotopaxi was closely monitored for seismic, thermal, fumarolic, and lahar activities. These activities remained within normal background levels until April 2015 (figure 3). Background levels of total seismic events had been in the range of 10-25 per day since 1996. They began to increase noticeably at the end of April, and reached a monthly total of 3,000 in May. The activity was located in the N and NE parts of the cone, at two different depths, 3 and 14 km below the summit. Figure 3. Rate of very long period (VLP) seismic events, associated with the movement of magma inside Cotopaxi, between January and the end of May 2015, showing an increase in the daily number of events beginning in late April. Courtesy of IG. Sulfur dioxide (SO2) emissions also increased from background levels of ~ 500 tons/day to 2,500-3,000 tons/day in late May and early June; climbers indicated intense sulfur dioxide odor on the N part of the cone during 22-23 May. Crater fumarolic activity also increased, with plumes sometimes visible from Quito (55 km N). Low-energy, pulsating gas emissions began on 10 June, and Cotopaxi National Park staff reported an increase of water flow in streams on the NE flank, suggesting increased heat flow around the volcano. New eruption begins on 14 August 2015. An earthquake swarm beginning in the late afternoon of 13 August 2015 was followed in the early morning of 14 August by two phreatic explosions (at 0402 and 0407). A third explosion occurred at 1027, and two additional smaller explosions were recorded later in the day at 1345 and 1429 (figure 4). Figure 4. Seismograph from 14 August 2015, station BREF Courtesy of IG (Cotopaxi 2015 Special Report No. 7). These eruptions were witnessed by many residents in the surrounding towns and from the Metropolitan District of Quito. The Washington Volcanic Ash Advisory Center (VAAC) reported plumes from the first two explosions rising to altitudes of 12.2-13.7 km, and IG reported that the plume from the 1027 eruption rose to an altitude of 17.9 km (58,700 ft). At 0715 on 15 August a pyroclastic flow descended the W flank, sending another ash plume to at least 15.2 km, according to Washington VAAC. The lower portions of the first two plumes drifted E and the higher parts drifted SE. The plume from the third explosion drifted NW and E. Ash from the pyroclastic event drifted 17 km W, 20 km NNW, and 8 km SE as reported by Washington VAAC. According to IG special reports, ashfall was reported in areas N and NW of the volcano (figure 5) as far as 48 km away in the Machachi region, Amaguaña, Bowling, Tambillo, and S of Quito. Parts of the Cotopaxi National Park were closed to visitors. During 16-18 August, ash emissions of variable height up to 1 km continued, drifting W.
Figure 5. Preliminary map of the ashfall deposits associated with the eruption of Cotopaxi on 14 August 2015. Courtesy of IG (Cotopaxi 2015 Special Report No. 9). The ashfall grainsize was sub-millimeter, consisting of granules, rock fragments, and mineral crystals typical of the andesitic rock of Cotopaxi. All fragments from the first eruptions appeared to be pre-existing rock, some altered, with no juvenile particles from new magma observed. During the post-eruption overflight on 18 August, IG scientists observed variable amounts of ash and steam rising more than 100 m above the crater before descending the W flank. Significant amounts of ash were deposited on the flanks in an area from the N to the SW. New cracks on the top of some glaciers were noted, especially on the E and NE flanks, and possible new tephra deposits on the N flank were observed. Thermal images did not reveal hot material on the flank and emissions prevented measurements inside the crater. For the next week after the initial explosions, steam-and-gas emissions were occasionally observed (figure 6), with plumes rising less than 2 km above the crater. Figure 6. Photo of Cotopaxi taken on 20 August 2015 showing a small explosion at 0740 as viewed from the Sector 2 Bridge along the General Rumiñahui Highway, 47 km N. Note the recent ash deposits covering the glacier near the top of the mountain. Photo by Camilo Zapata , courtesy of IG (Cotopaxi 2015 Special Report No. 9). On 22 August at 0426 the network detected an increase in the seismic amplitude, and steam-and-ash plume emissions rose to more than 3 km above the summit. More tremors at 2141 were accompanied by the onset of continuous ash emissions which rose less than 1 km above the crater, drifting SW. Rangers confirmed ashfall at the entrance of Cotopaxi National Park. The following morning IG staff found 2-mm-thick ash deposits that had accumulated during an 18-hour period. Ash deposits were also noted on 24 and 25 August in most of the N parts of Latacunga valley located about 18 km WSW of the mountain, as well as the S hills of Romerillos 15 km NW, Machachi (24 km NW), El Chaupi (24 km WNW), and Tambillo (32 km NNW). Regular overflights were conducted by IG after the initial eruption. In September 2015 several new cracks in the glaciers were noted, and volcanic blocks had been deposited on the N and S flanks of the crater. The circular glacier at the top of the crater had significantly decreased in size and developed large fractures. Glacial melting on the upper flanks had also accelerated; streams of meltwater were present on the N flank. By late September, the glacier inside the crater had almost disappeared. Several areas of landslide deposits inside and outside the crater were also noted. Yellowish-green deposits from increased fumarolic activity were most apparent on the S, SE, and E flanks. Rapid melting from the glacier was evident on the upper E flank which resulted in material falling onto the lower part of the glacier. Seismicity, deformation, fumaroles, ash plumes and ash fall, SO2 emissions, and lahar activity all continued for several months as discussed below, gradually tapering off toward the end of 2015. Seismic activity. Seismic data during the August through December 2015 period correlated closely with the rise and fall of eruptive activity. The measurements of the average seismic amplitudes (RSAM) for the volcano (figure 7) reveal the dramatic increase in total seismic energy during the main eruptive phase between mid-August and early September. Figure 7. Measurement of daily average seismic amplitude (RSAM) for Cotopaxi from 1 January 2015 through 10 October 2015. The solid and pink-dashed lines represent previous background averages for RSAM. Courtesy of IG (Cotopaxi 2015 Special Report No. 20). Numbers of tremor signals indicating emissions (figure 8) showed a dramatic increase beginning on 14 August, and remained elevated through the initial eruptive cycle ending in early September. A second episode of emission activity in mid-October had fewer events, but the number was still higher than background levels. Seismic activity from emissions tapered off substantially after mid-October. Figure 8. Plot of number of daily seismic tremor events indicating emissions at Cotopaxi, 1 August through 19 October 2015. Courtesy of IG (Cotopaxi 2015 Special Report No. 20). The number of daily volcano-tectonic (VT), or fracture-related earthquakes, located immediately beneath the crater to a depth of 12 km, increased starting in mid-August, to a maximum of over 200 events on 20 September before declining below 100 in early October. In September, the higher daily number of VT signals 3-12 km deep aligned with the conduit were interpreted by IG scientists as movement in a magma reservoir. Elevated numbers of VT events continued into February 2016, when they dropped back close to background levels (figure 9). Figure 9. Plot showing number of daily volcano-tectonic (VT) (top), explosive (middle), and hybrid-type (HB) (bottom) seismic events at Cotopaxi between 1 January 2015 and 15 February 2016 (G. Viracucha). Courtesy of IG (Cotopaxi 2016 Special Report No. 4). Deformation. As part of the activities conducted jointly by the French IRD (Institut de Recherché pour le Developpement) and IG, Jean Mathieu Nocquet analyzed the deformation data from the volcano (figure 10). The accumulated movement of the GPS points between 1 January and 1 October 2015 is shown with values corrected for drift due to tectonic movement and seasonal effects based on data from 2010-2015. The strain level was low but significant compared to other deformation events prior to eruptions. The rate of deformation began accelerating in April 2015. The maximum total movement during this time was 1 cm at sites on the W flank. The average rate of deformation observed during this period was 3 mm per month. Figure 10. Deformation observed between 1 January and 1 October 2015 at GPS stations after correcting values for tectonic movement and seasonal changes. The yellow arrows show horizontal movement of the terrain and red show vertical changes. Scales are shown in the lower left corner. Produced by Dr. Jean Mathieu Nocquet. Courtesy of IG (Cotopaxi 2015 Special Report No. 20). Ash and steam emissions. Ashfall calculations reported by IG for 14 August through 25 September were 771,000 m3 and 9.46 × 108 kg. IG scientists estimated that the volume of the initial plume material ejected on 14 August was 56,000 m3. The largest volume of tephra was erupted during 22-28 August. The area most affected that week was west of the volcano between San Juan de Pastocalle (20 km WSW) and El Chaupi (24 km WNW). Based on Washington VAAC reports, IG noted on 26 August that the plume rose as high as 9 km. As a result of this, during the last week in August, areas over 200 km to the W, WSW and SW, and up to 95 km NW reported ashfall, millimeters thick in some areas. The mayor of Sigchos, in the Province of Cotopaxi, noted impacts on livestock, crops, and greenhouses (figure 11). Figure 11. Farmland covered by a blanket of ash in Romerillos, 15 km NW of Cotopaxi, on 28 August 2015. Photo by P. Mothes. Courtesy of IG (Cotopaxi 2015 Special Report 13). A news article from 14 September noted that area flights had been re-routed around Cotopaxi to avoid ash plumes; the most affected route was between Quito and Guayaquil. Based on information from Washington VAAC, during 4-11 September the ash clouds associated with activity at Cotopaxi affected a large area of Ecuador (figure 12). Figure 12. Zones with potential ash cloud hazards associated with the activity of Cotopaxi during 4-11 September 2015. Courtesy of IG (Cotopaxi 2015 Special Report 16, using data from the Washington VAAC on a Google Earth base map). The height of the ash clouds during 4-11 September decreased from over 6 km above the crater the previous week to less than 3 km, along with a decrease in the intensity of seismic activity. The speed of the ash clouds during this week varied between 3.9 and 14.1 meters per second (m/s) with the prevailing wind direction towards the west (between SW and W). Clouds of ash reached the W coast, drifting as far as 465 km on 9 September. There were at least two VAAC reports issued in October, but the volumes and masses of these eruptions were not calculated. Significant ash-and-steam emissions continued from Cotopaxi until 23 November 2015 . The plumes generally rose no more than 2 or 2.5 km above the crater and usually drifted N or NW, and occasionally W or SW. Intermittent ashfall was reported from numerous towns through 18 November, generally from areas W and N of the volcano at distances up to 60 km. A summary of towns that reported ash and their distance and direction from Cotopaxi is shown in Table 4. The last significant ashfall reported by IG was on 23 November 2015. By December, the height of the steam plumes had decreased to consistently 1 km or less above the crater. No ashfall was reported in December inside the park or surrounding area, but traces of ash were observed covering parts of the glacier on the flanks of the volcano. At 1843 on 24 January a plume with low-to-moderate levels of ash rose 700 m above the crater and drifted W. The emission coincided with a hybrid earthquake. This was the last reported ash through March 2016. Ash characteristics. Analysis of ash collected on 2 September showed that the greatest contribution of material was from pre-existing and altered rock. A week later, analysis of ash samples showed an increase in the proportion of juvenile fragments. A grain size analysis of ash samples indicated a very high proportion of extremely fine ash (30 to 75% less than 63 microns). Other than the ash recovered on the first day of the eruption (14 August ) which had a slightly larger size distribution, subsequent samples were consistently very fine to extremely fine in size. Component analysis performed with binocular and scanning electron microscopes clearly showed an evolution of the ash toward a decreased contribution of preexisting rock (lithic fragments with pyrite, grey scoria with vesicles filled with hydrothermal material, hydrothermal quartz) and an increased proportion of fresh magmatic material (free crystals, glass particles with few vesicles and a high percentage of microlites), especially after 28 August (figure 13). SO2 emissions. SO2 emissions at Cotopaxi began to rise above typical background levels of ~ 500 t/day in late April 2015, and were consistently above 2,500 t/d by late May (figure 14). Values measured by IG scientists peaked on 15 August, the day after the initial explosion, at 16,700 t/d, and declined to 5,490 by 20 August. Emissions on 14 August were also detected by the Ozone Monitoring Instrument (OMI) (figure 15). A total of 350,000 tons of SO2 emissions was recorded in August 2015. Values spiked between 5,000 and 10,000 t/d numerous times between 14 August and late November 2015 before slowly decreasing to levels below 1000 t/d by January 2016, somewhat above background averages. Figure 14. Plot of SO2 emissions (tons/day) at Cotopaxi from 1 January 2015 through 15 February 2016. Courtesy of IG (Cotopaxi 2016 Special Report 4, graph created by D. Sierra, IGEPN). Area where SO2 gas emissions from Cotopaxi were detected by the OMI instrument on 14 August 2015. Red indicates higher concentrations. Courtesy NASA Goddard Space Flight Center (GSFC). Thermal Monitoring. The first thermal images obtained after the explosions in August occurred during overflights on 18 and 26 August, and revealed a significant increase in the temperatures of emissions. The Maximum Apparent Temperature (MAT) was 150° C on 26 August at several different areas within the crater. By 3 September, thermal images revealed temperature increases in the S and E parts of the crater to 200° C. Bright areas at the summit were observed at night, possibly from hot block deposits. During the 9 September overflight infrared measurements indicated that temperatures had begun to decrease. This decrease continued until 29 September when new thermal anomalies on the upper parts of the outer crater were identified, likely from newly deposited material. On a clear 2 October, IG geoscientists were able to measure and photograph the thermal anomalies identified and analyzed in previous flights (figure 16). The Maximum Apparent Temperature for the entire inner crater was 104.3° C. The MAT measured on the E flank of the volcano was 57.9° C, up from 51° C measured in the previous flight on 29 September. By 26 January, the thermal image data revealed a significant decline of the MAT to 51.9° C at the bottom of the inner crater. Figure 16. Thermal image showing the highest value of MAT corresponding to the inner crater at 104.3° C. The MAT flank temperature is 57.9° C. Courtesy of IG (Cotopaxi 2015 Special Report 19; image by M. Almeida and S Vallejo, IG-EPN). Lahars. The first lahar generated by the eruptions descended the W flank of Cotopaxi on 28 August, detected as a high-frequency seismic signal from two stations on the W flank (figure 17). It was a small flow remobilized by a light rain. IG technicians located the flow and determined that the flow rate did not exceed 10 m3/s, and that it remained near the top of the volcano. Figure 17. A small lahar generated by minor rainfall descended the W flank of Cotopaxi on the afternoon of 28 August 2015. It was located far from any road or infrastructure. Courtesy of IG (Cotopaxi 2015 Special Report 13; photo by D. Andrade). There were 58 total rainfall-induced lahars detected through March 2016, with the largest numbers occurring in November and February. They primarily descended the NW and W flanks of the volcano. Four small lahars from the melting glacier were reported in December. The largest lahar occurred at 1336 on 13 January in the Agualongo gorge (approximately 15 km. SW of the summit); a seismic station on Cotopaxi's W flank recorded an hour-long signal caused by the lahar. Preliminary results indicated that the peak flow rate was around 40 m3/s with a volume of about 50,000 m3. The lahar left deposits on the bridge that crosses the river (figure 18). Figure 18. The System ECU-911 camera photographed the evidence left after the passage of a lahar across a bridge over the Agualongo gorge (approx. 15 km SW of the summit) on 13 January 2016. Courtesy of IG (Cotopaxi 2016 Special Report 2). Post-eruption activity. In late December, after 119 days of closure due to volcanic activity, the Cotopaxi National Park reopened to visitors, as both seismic and surficial activity had declined significantly. By 29 January IG reported that surficial activity was characterized by minor steam emissions from the crater and sporadic gas emissions with minor amounts of ash (the last ash emission was reported on 24 January). Sulfur dioxide (SO2) emissions were less than 1,000 tons per day (near pre-eruptive levels) by the end of January and seismicity had almost returned to baseline levels. Observations in late January 2016 indicated that the glaciers were continuing to move downslope with fractures and cracking, and continued glacial melting was observed as well. Cotopaxi remained quiet through March 2016 with minor gas emissions rising 600 m above the crater and drifting N and NW. The glacier remained cracked, and glacial melting had decreased considerably. Table 4. Towns and villages reporting ashfall from Cotopaxi, August-November 2014. Information Contacts: Instituto Geofísico, Escuela Politécnica Nacional, Casilla 17-01-2759, Quito, Ecuador (URL: http://www.igepn.edu.ec/); Washington Volcanic Ash Advisory Center (VAAC), Satellite Analysis Branch (SAB), NOAA/NESDIS E/SP23, NOAA Science Center Room 401, 5200 Auth Rd, Camp Springs, MD 20746, USA (URL: http://www.ospo.noaa.gov/Products/atmosphere/vaac/); OMI (Ozone Monitoring Instrument), Global Sulfur Dioxide Monitoring, Atmospheric Chemistry & Dynamics, NASA Goddard Space Flight Center, Goddard, Maryland, USA (URL: https://so2.gsfc.nasa.gov/); El Comercio (URL: http://www.elcomercio.com/actualidad/aerovia-actividad-cotopaxi-ecuador-negocios.html). During an overflight of Cotopaxi on 10 May, scientists observed minor gas emissions rising 600 m above the crater and drifting N and NW. Glaciers remained cracked, though glacial melting observed in recent months had decreased considerably. The temperature of flank fumaroles had decreased slightly. On 29 January IG reported that in recent weeks surficial activity at Cotopaxi was characterized by minor steam emissions from the crater and sporadic gas emissions with minor amounts of ash. Sulfur dioxide emissions were less than 1,000 tons per day (pre-eruptive levels) and seismicity had almost returned to baseline levels. At 1843 on 24 January a plume with low-to-moderate levels of ash rose 700 m above the crater and drifted W. The emission coincided with a hybrid earthquake. IG reported that at 1336 on 13 January a seismic station on Cotopaxi's W flank recorded an hour-long signal caused by a lahar. Preliminary results indicated that the peak flow rate was around 40 m3/s with a volume of about 50,000 m3; the lahar was the largest recorded at the volcano since the current eruption began. Lahars also descended the Agualongo River, leaving deposits on the bridge that crosses the river. IG reported that after 119 days of closure due to volcanic activity at Cotopaxi, the Cotopaxi National Park reopened to visitors. Both seismic and surficial activity have declined in recent weeks. IG reported that during 2-8 December seismic activity at Cotopaxi was characterized by volcano-tectonic, hybrid, and long-period events. Signals indicating emissions and explosions were also detected. Although cloud cover often prevented observations, gas-and-steam emissions were visible daily. A plume containing ash rose as high as 1 km and drifted NW on 7 December. IG reported that during 25 November-1 December seismic activity at Cotopaxi was characterized by volcano-tectonic, hybrid, and long-period events. Seismic signals indicating emissions and explosions were also detected. Although cloud cover often prevented observations, gas-and-steam emissions were visible daily. The plumes contained ash on most days and rose as high as 1 km, drifting W and SW. Lahar descended the Agualongo river during 28-29 November and the Mariscal Sucre river on 29 November. IG reported that during 18-24 November gas, steam, and ash plumes rose almost daily from Cotopaxi, as high as 1.5 km above the crater, and drifted W, and SW. Ashfall was reported in Machachi and Aloasí on 18 November. IG reported that during 11-17 November gas, steam, and ash plumes rose from Cotopaxi as high as 2 km above the crater and drifted NW, W, and SW.
IG reported that during 4-10 November gas, steam, and ash plumes rose almost daily from Cotopaxi as high as 1.5 km above the crater. Minor ashfall was reported S of the volcano on 6 November, and small lahars descended the W flank during 6 and 8-9 November. IG reported that although cloud cover often obscured views of Cotopaxi during 28 October-3 November emissions were observed daily; gas, steam, and ash plumes rose as high as 1.5 km and drifted W, SW, S, and E. A small lahar descended the W flank on 31 October. IG reported that during 21-27 October gas, steam, and ash plumes rose from Cotopaxi almost daily as high as 2 km above the crater and drifted NW, W, and SW. A small lahar detected on 24 October descended the NW flank but stayed with Cotopaxi National Park boundaries. A small lahar descended the W flank the next day. IG reported that during 14-20 October cloud cover sometimes obscured views of Cotopaxi although emissions were observed daily. Gas, steam, and ash plumes rose as high as 2 km above the crater and drifted W, NW, N, and E. Small lahars descended the NW flank during 14-15 October, and a small lahar traveled down the Agualongo gorge on 16 October. Ashfall was reported during 16-17 and 19-20 October in Ticatilín, Lasso (60 km N), Chasqui (48 km NNW), Agualongo, Mariscal Sucre (50 km NNW), Rumipamba, San Fernando (58 km NNW), Selva Alegre (54 km NNW), Rumiñahui (61 km N), Vallecito, Aloasí (23 km NW), Aloag (28 km NW), Jambelí, El Chaupi (24 km WNW), Tanicuchi (25 km SW), and Maldonado. IG reported that during 7-13 October gas, steam, and ash plumes rose from Cotopaxi as high as 2.5 km above the crater and drifted NW, W, and SW. Ash fell on the N flank on 7 October. Ashfall was also reported in El Chasqui Chaupi, Machachi (24 km NW), Aloag (28 km NW), and Obelisco on 8 October, and in San Ramón, San Agustín, San Isidro (58 km N), Rumipamba de Espinosas (53 km NNW), Callo Mancheno, Santa Catalina (52 km N), and San Francisco on 13 October. During an overflight of Cotopaxi on 29 September, IG scientists observed low-energy pulsating emissions with low or no ash content that rose 1 km above the crater and drifted W. Fracturing continued on both the upper and lower parts of the glacier, at the toes. Rapid melting had occurred from the glacier on the upper E flank which resulted in material falling onto the lower part of the glacier. New thermal anomalies on the upper parts of the outer crater were identified, likely from newly deposited material. During 30 September-6 October gas-and-water vapor plumes sometimes with low ash content rose as high as 2 km and drifted in multiple directions. Ashfall was reported in Tanicuchí (25 km SW) on 1 October. During an overflight of Cotopaxi on 22 September, IG scientists observed low-energy emissions with low or no ash content that rose 500 m above the crater and drifted W. Fracturing continued on both the upper parts of the glacier and the glacial toes on the N, NW, and SW flanks. The glacier inside the crater had almost disappeared. Several areas of landslide deposits inside and outside of the crater were noted. Yellowish-green deposits from increased fumarolic activity were most apparent on the S, SE, and E flanks. Thermal images revealed temperature decreases since the previous overflight at the new vents inside the crater and at areas on the S flank. During 23-29 September gas-and-water vapor plumes, often with low ash content, rose as high as 2 km and drifted mainly W and SW.
During 1-8 September IG reported that a large number of seismic events were located between 2 and 11 km below Cotopaxi's summit; seismicity consisted of long-period events, very-long-period events, tremor, and volcano-tectonic events. During 5-10 September seismic energy decreased along with the size and ash content of emissions. Analysis of ash samples showed an increase in the proportion of juvenile fragments. During an overflight on 9 September, IG scientists observed an ash plume rising 200-300 m above the crater and drifting W. Infrared measurements revealed that temperatures were well below those measured on 3 September. Glacial melting on the upper flanks continued to produce streams of meltwater on the N flank. Several new cracks in the glaciers were noted. On 11 September tremor was low; gas-and-ash emissions rose 500 m and drifted W. On 12 September gas-and-ash plumes rose 1.5 km and drifted W to NW, causing ashfall in Machachi and El Chaupi. During 14-15 September ash emissions rose 1 km. A news article from 14 September noted that area flights had been re-routed around Cotopaxi to avoid ash plumes; the most affected route was between Quito and Guayaquil. IG reported that during the morning on 2 September gas-and-steam plumes from Cotopaxi contained minor amounts of ash, rose 100 m above the crater, and drifted W and NW. At about 1318, plumes with moderate amounts of ash rose 4 km and drifted W. Ashfall was reported in Machachi, Aloasí, and Chaupi. Analysis of ash collected on 2 September showed that the greatest contribution of material was pre-existing and altered rock. On 3 September ash-and-water-vapor plumes rose 2.2 km and drifted N and NW. During an overflight scientists observed ash emissions that rose 1 km and drifted W then N; the plume continued to rise to 8.5 km as it drifted N. Several new cracks in the glaciers were noted, especially on the E and NE flanks. Blocks had been deposited on the N and S parts of the crater. The circular glacier at the top of the inside part of the crater had significantly decreased in size and had large fractures. Glacial melting on the upper flanks had also accelerated. Streams of meltwater were present on the N flank. Thermal images revealed temperature increases in the S and E parts of the crater and a significant increase in temperatures of emissions (200 degrees Celsius). Seismic amplitudes did not increase but signals 3-11 km deep aligned with the conduit suggested rising magma. Bright areas at the summit were observed at night, possibly from hot block deposits. During 4-8 September gas-and-ash plumes rose 1 km at most and drifted N and NW. According to IG, fieldwork revealed that the volume of material ejected since the onset of the eruption at Cotopaxi was an estimated 56,000 cubic meters on 14 August and 19,500 cubic meters during 15-21 August. Thermal images obtained during overflights on 18 and 26 August revealed a significant increase in the temperatures of emissions (150 degrees Celsius on 26 August) and at different areas in the crater. Since the onset of continuous tremor on the evening of 22 August there had been very few breaks in ash-and-gas emissions. During 25-31 August ash-and-steam emissions were observed rising at most 2 km above the crater and drifting NW, W, and SW. Based on Washington VAAC reports, IG noted on 26 August that the plume rose as high as 9 km (29,500 ft) a.s.l. Ashfall was reported in a wide area to the WSW, millimeters thick in some areas. During 25-26, 28, and 30-31 August areas reporting ashfall included Manabi (El Carmen, 165 km W), Santo Domingo de los Tsáchilas (95 km NW), Pastocalle, Santa Ana, Cerro Azul, Azachul, Leonidas Plaza (40 km N), Bahia de Caraquez (220 WNW), Charapotó (230 W), Pichincha, Rocafuerte (225 WSW), Machachi (25 km NW), Tambillo (33 km NNW), Aloag (28 km NNW), and Chaupi. The mayor of Sigchos, in the Province of Cotopaxi, noted impacts on livestock, crops, and greenhouses. A small lahar descended the W flank on 28 August. Emissions later in the day on 31 August were mostly water vapor and gas, with low amounts of ash. IG reported that during an overflight of Cotopaxi on 18 August scientists observed continuous but variable amounts of ash and steam rising more than 100 m above the crater before descending the W flank. Significant amounts of ash were deposited on the flanks in an area from the N to the SW flanks. Several new cracks on the top of some glaciers were noted, especially on the E and NE flanks, and possible new tephra deposits on the N flank were observed. Thermal images revealed no hot material on the flanks; emissions prevented measurements of the inside of the crater. During 18-19 August emissions of steam and gas from Cotopaxi were occasionally observed during periods of clear weather. During the morning of 20 August gas plumes rose just above the crater and drifted W. The next day gas-and-steam plumes rose less than 2 km above the crater and drifted NW; cloud cover continued to sometimes prevent visual observations. On 22 August at 0426 the network detected an increase in the seismic amplitude. Steam-and-ash plumes rising 2 km from the crater were more sustained and higher compared to previous days; plumes drifted NW and WSW. Tremor began at 2141, and was accompanied by the onset of continuous ash emissions. Rangers confirmed ashfall at the entrance of Cotopaxi National Park. Throughout 23 August continuous ash emissions occurred with few breaks, rising no more than 1 km above the crater, and drifting SW. IGEPN staff found 2-mm-thick ash deposits that had accumulated during an 18-hour period. On 24 August ash deposits were noted in most of the N parts of Latacunga valley and reached the S moors of Romerillos. On 25 August ash plumes drifted WNW, causing ashfall in Machachi, Chaupi, and Tambillo. On 14 August IG reported an earthquake swarm at Cotopaxi that began at 1721 and ended at 1806; the largest event, detected at 1723, was a M 2.7. A series of phreatic explosions on 15 August started with two small ones detected at 0402 and 0407. According to the Washington VAAC, ash plumes rose to altitudes of 12.2-13.7 km (40,000-45,000 ft) a.s.l. ; lower parts of the plume drifted E and higher parts drifted SE. Ashfall occurred in areas to the N. IG noted that an explosion at 1027 generated an ash plumes that rose to an altitude of 17.9 km (58,700 ft) a.s.l. and drifted NW and E. A pyroclastic flow descended the W flank. The VAAC initially reported that ash from that event drifted 17 km W, 20 km NNW, and 8 km SE, and that plumes may have risen as high as 15.2 km (50,000 ft) a.s.l. and possibly higher. According to news articles, ashfall was reported in El Chasqui (48 km N), Machachi (22 km NW), Tambillo (32 km NNW), and in areas in S Quito (~45 km N) including Cutuglagua, Guamaní, Chillogallo, Santa Barbara, and Solanda. Parts of the Cotopaxi National Park was closed to visitors. During 15-16 August sulfur dioxide emissions were high, and remobilized ash from the W flank rose up to 3.3 km; no ashfall was reported and only minor amounts of a sulfur odor were noted by residents. Ash plumes rose 300 m on 17 August and drifted W; at 1824 an ash emission rose 700 m and drifted W. During times of clear views observers noted that winds pushed ash plumes down the W flank. On 11 June IG reported that seismicity at Cotopaxi continued to increase. Tremor began to be detected on 4 June, with periods ranging from 10 to 15 minutes. Amplitudes were highest during 5-6 June. Sulfur dioxide emissions continued to be elevated over baseline levels (which were less than 500 tons/day), detected at values greater than 2,500 tons/day. Low-energy, pulsating gas emissions began on 10 June, and Cotopaxi National Park staff reported an increase of water flow in some streams on the NE flank. IG reported that the seismic network at Cotopaxi had detected increases since mid-April; 628 local earthquakes were detected in April and 3,000 events were detected in May. Very-long-period earthquakes were recorded in May, especially during the last week, located in the N and NE parts of the cone at depths of 3 and 14 km. Sulfur dioxide emissions increased on 20 May, possibly from sporadic emissions becoming more continuous, and were 2,500-3,000 tons/day by the end of May. Baseline values were 500 tons/day. Slight inflation was detected by N and NE inclinometers. Crater fumarolic activity increased, with plumes sometimes visible from Quito (55 km N). Climbers indicated a very intense sulfur dioxide odor on the N part of the cone during 22-23 May. During 29 August to 4 September, the number of long-period and hybrid earthquakes at Cotopaxi decreased slightly, and the number of volcano-tectonic earthquakes increased, in comparison to the previous week. No changes in deformation were recorded, and no surficial changes were seen at the volcano. During 22-28 August, a large number of long-period (LP) and hybrid earthquakes continued to be recorded at Cotopaxi. Increased seismicity was first recorded in late July. Most of the events recorded during the report period were small, and were recorded mainly at stations nearest to the crater. Also, several LP earthquakes correlated with increased activity at fumaroles in the crater. No deformation or surficial changes were observed at the volcano. A seismic anomaly that began at Cotopaxi in late July continued through 14 August. During this period, there was an increase in the number of long-period earthquakes in comparison to previous months. The earthquakes were less than M 3 and occurred at depths between 1 and 2 km below the volcano. Several of the earthquakes correlated with increases in the volume of fumarole emissions in the crater. No carbon dioxide was detected when measurements were made during 8-14 August. During 29 December to 4 January, the number of earthquakes at Cotopaxi slightly increased in comparison to the previous week. On 2 January a strong smell of sulfur was reported in the Yanasacha area. During 15-21 December, there was a slight reduction in the level of seismicity at Cotopaxi in comparison to the previous week. The number of long-period earthquakes increased around 20 December. No volcano-tectonic earthquakes were recorded. Only fumarolic activity was observed at the volcano. Seismicity at Cotopaxi during 8-14 December was above background levels, much like the previous week. During the report period, there was an increase in high-frequency tremor, but it remained within "normal" limits. A weak scent of sulfur was reported and steam columns rose to low levels. During 10-16 November, seismicity at Cotopaxi was at moderate levels, although it had increased in comparison to previous weeks. During the report period, seismicity was dominated by long-period earthquakes. Since late October volcano-tectonic earthquakes occurred beneath the zone of Pita and beneath the volcano's edifice. These events were less than M 3 and were not felt by the local population. On 23 July 1975 small grayish puffs of smoke were observed emanating from the crater. In mid-September a 300-m vapor plume rose above the crater, and a small earthquake shook the volcano on 24 September. In mid-October vapor plumes were reported to be increasing in volume and frequency. Cotopaxi last erupted in 1944. Information Contacts: M. Hall, Escuela Politécnica, Quito. The activity continued during November. The amount of vapor was about the same as in October, but daily cloud activity was observed. There was increased fumarolic activity on the W side, just below the crater. Earthquakes were felt in the town of Mulaló around 0000, 11 November, and at 0431, 12 November, and again on 14 November. Three portable seismographs were placed around the volcano, and were gathering valuable seismic data by the end of the month. Activity declined during December. The crater steam clouds of previous months were observed only once, on 12 December, since 28 November. Seismic activity was not strong and focal depths were at least 20 km below the volcano. Relevelling of dry tilt stations installed 7 November showed no inflation of the volcano. However, a USGS team including Donal Mullineaux and C. Dan Miller reached Ecuador in late December to assess volcanic hazards and assist the local authorities in contingency planning. The last Cotopaxi report (SEAN 01:03) described a decline in activity during December 1975. Beginning in October 2001, anomalous seismic activity was registered. Seismicity increased further during November 2001-January 2002, and at times was up to seven times the normal level (tables 1 and 2). During this period, other seismic signals were registered that were distinct from those during the 13 previous years of monitoring, including: tornillos, explosion events, bands of harmonic tremor sometimes lasting a few minutes, and deep, high-energy long-period (LP) events registered away from the volcano (at the Antisana and Guagua Pichincha stations). Seismic observations and statistics were compiled using station "VCl," located ~4 km NE of the volcano. Earthquake locations were determined using records from the seven seismic stations on different flanks of Cotopaxi, and for higher-energy events with stations of the National network. Table 1. Monthly seismicity at Cotopaxi during 2001-2002. Data includes Total and Daily averages for long-period (LP) events, hybrid events, volcano-tectonic (VT) events, tornillo events, and all earthquakes. Courtesy IG. Table 2. Comparison of average seismicity at Cotopaxi during 2001 and 2002. Courtesy IG. On 5 and 29 January 2002, two seismic clusters lasted an average of 2 hours and were composed mainly of LP and VT earthquakes. Most of the earthquakes were located at depths of 1-10 km beneath the summit. On 5 and 13 January small fumaroles were reported in the crater, and visible defrosting occurred on the upper E flank. A visit to the summit on 13 January revealed increased fumarolic activity compared to previous months. On 19 and 20 January observers reported gray plumes rising as high as 1,000 m.
During February and March activity diminished, and no seismic clusters were registered. Most of the earthquakes were located 1-10 km beneath the volcano. On 5 February roaring noises were heard from Mulaló and the refuges located on the flanks of the volcano. Strong fumarolic activity was also reported. On 6 February steam plumes rose ~300 m above the summit. On 27 February a small steam plume was reported exiting from the NW side of the crater. On 7 and 10 March small steam plumes originated from the W side of the crater. On 28 March harmonic tremor lasted for ~10 minutes. Activity remained low during April-June. On 17 April a band of harmonic tremor lasted ~6 minutes with a maximum frequency of 4.3 Hz. During the first days of April small steam plumes were reported. During May LP earthquakes lasted up to a minute and saturated the seismometer for several seconds. On 20 May a seismic cluster of LP earthquakes lasted ~2 hours. On 8 and 14 May a white steam plume from the NE side of the volcano reached up to 200 m high. During June VT events mostly occurred ~10 km N of the crater. On 30 June a band of harmonic tremor lasted ~7 minutes with a maximum frequency of 1.7-5.2 Hz. Visits to the summit on 1 and 2 June revealed that fumarolic activity had diminished ~40% since January. During July seismicity was at a moderate level with respect to the rest of 2002. During the first days of the month a series of LP events were registered that were large enough to be detected at distant stations, such as Antisana and Guagua Pichincha. The earthquakes had maximum frequencies of ~2.1 Hz and were generally 1-2 km beneath the summit. However, some events were located at depths of ~10 km. On 18 July at 2000 a band of low-frequency tremor lasted ~4 minutes. About 5 hours later a seismic cluster began that lasted for ~8 hours. The cluster consisted of ~110 total events, mostly hybrid (HB) and volcano-tectonic (VT). The earthquakes were located 1-4 km beneath the summit, and 2 LP events were located ~10 km deep. Visitors to the summit on 6 July reported fumarolic activity in the zone of Yanasacha, a slight sulfur smell on the NE side, and noise generated by an avalanche on the E side. At the end of July reports indicated defrosting in the W zone. During August moderate seismicity was dominated by LP events at a depth of ~10 km. Seismicity was again high in September 2002. A small cluster of VT earthquakes on 15 September lasted ~7 hours. During the first days of the month a visit to the crater revealed new fumaroles in the E and S zones. Defrosting continued in the W zone and left 40% of the W wall open. During October seismic activity was low but the number of hybrid events increased compared to the previous months. Tectonic events were registered in the S and N zones up to ~7 km from the summit. Deep LP events decreased by ~50% compared to previous months. Seismicity remained low during November and December. Less than 10% of VT events were registered in the N sector. No fumarolic or other surface activity was observed. During December seismic events were located 1-7 km beneath the summit. On 7 December people in Yanahurco reported dark brown plumes rising from the crater. Seismicity since 1989 clearly shows an increase in recent months (figure 1). The 2001 seismic events were registered at 1-10 km beneath the volcano, but ~90% occurred at 2-4 km and showed little migration. The 2002 activity was variable, from a high of 966 events in January to a low of 420 events in April. Mostly LP events occurred with some VT events during the first half of the year, and later mostly LP events with hybrids during the second half of the year. On the basis of 2002 seismic activity, a new injection of magma did not occur, and the anomalies in July and September were the result of the movement of gas from magma intrusion that occurred during the last months of 2001. Figure 1. Graph of the total registered monthly events at Cotopaxi during 1989-2002. The activity increased beginning in November 2001 and has since remained above background levels. Courtesy of IG. Information Contacts: Geophysical Institute (IG), Escuela Politécnica Nacional, Apartado 17-01-2759, Quito, Ecuador. This report contains details of seismicity at Cotopaxi during January through 2 May 2003. The seismicity was generally low (averaging ~20 earthquakes per day), as it has been since 24 November 2001. Despite the low seismicity, during January seismic signals suggestive of emissions registered, although these lacked visual confirmations at the volcano. Moreover, a cluster composed of a variety of kinds of shallow earthquakes took place in mid-March. This was the first such cluster since 19 July 2002. Activity during January-February 2003. Seismicity was generally low in January 2003 and located earthquakes commonly had focal depths down to 5 km below the summit. During the first week of January one volcano-tectonic (VT) event occurred N of the volcano. Around this time the rate of energy release was very low and no unusual observations were reported. Seismicity decreased after the first week of January, although some long-period (LP) events occurred, including one of high frequency (10 Hz) on 9 January that was followed immediately by another with a slowly decaying coda or tail (a so-called "tornillo" event, with a dominant frequency of 2.7 Hz). Two LP events were located at depths of 1 km. The rate of energy release remained very low, with some peaks on 8 January. Seismicity stayed low through the next week; some hybrid and LP events did occur. Some signals characteristic of emissions were received, although these were not visually confirmed. During 20-26 January the number of hybrid events increased slightly, to above average. Emission signals were again received, similar to the previous week. No LP earthquakes were recorded this week, but a small group of earthquakes were located at the headwaters of the Pita river. Events such as these were also noted in November 2001. During the last week of January, seismicity remained low, on a par with activity seen since 24 November 2001. However, the low number of events registered or located was partly because arrivals were not clear at many stations. Seismicity remained low in February, particularly for the first week. During 10-16 February it rose slightly due to larger numbers of hybrid events. No other changes in the volcano were noted. Although the third week of February brought no important variations in seismicity, beginning in late February LP events dominated the record. Still, the number of LP event stayed below the 2002 average. Activity during March-April 2003. Although low seismicity generally prevailed throughout this interval, there was some variations in the abundance of earthquake types and a mid-March cluster of earthquakes occurred. During early March hybrid earthquakes increased to slightly higher than the 2002 average; in addition another LP-type tornillo was recorded on 6 March. On 7 March LP earthquakes were common. On 16 March a cluster of hybrid, VT, and LP earthquakes was located 1-3 km below the volcano. Following eight months of low seismicity (averaging ~20 events per day), this was the first seismic swarm registered at Cotopaxi since 19 July 2002. However, the energy released per number of events was similar to earlier activity. Seismicity increased after 16 March. Clusters similar to that of the 16th continued, but with lower magnitudes. By the beginning of April seismicity decreased to within the base level, although on 4, 7, and 8 April VT events were recorded to the S and SE, approximately 3 km below the summit. No significant changes were noted at the volcano, although the usual smell of sulfur was noted on a visit to the summit. During 14-20 April, the number of LP events decreased from the previous week, but VT events of M 2.5-M 3.4 continued to the N. VT events persisted through the rest of April, particularly in late April, which on 23 April included an M 3.6 event. VT events occurred on the N, NE, and S sides of the volcano up to 15 km from the summit at depths between 3 and 15 km. The VT events were interpreted as related to rock fracturing. On the morning of 2 May a VT event registered on the S flank, located ~3 km deep. It was M 3.2, moderate for Cotopaxi. Later that day an event registered at the seismic stations at Cotopaxi, Antisana, and Guagua Pichincha. This event had a duration of 180 seconds and was made up of an LP earthquake followed by a tremor-like signal with a duration of 150 seconds that was of low frequency (1.6 Hz). Information Contacts: Geophysical Institute (IG), Escuela Politécnica Nacional, Apartado 17-01-2759, Quito, Ecuador (URL: http://www.igepn.edu.ec/). This report contains details of seismicity at Cotopaxi during May through December 2003. In general, seismicity was low and within normal levels, occasionally punctuated by increased activity. Fumarolic and inflationary activity varied throughout the period. Seismicity during the first week of May was characterized by a high number of fracture-related volcano-tectonic events in the N, NE, and S zones, up to 15 km from the summit. These events were located at depths between 3 and 15 km below the summit. On 2 May at 0949 a volcano-tectonic event on the S flank occurred at ~ 3 km depth. Based on the coda, the event was calculated as M 3.2, a value considered moderate at this volcano. At 1918 on 2 May a long-period event was recorded at the Cotopaxi, Antisana, and Guagua Pichincha seismic stations. It lasted about 180 seconds. The earthquake was followed by a low-frequency (1.6 Hz) tremor signal lasting about 150 seconds. Between 2 and 4 May deflation was recorded, with slight variations. On 2 May staff at the Refuge felt earthquakes. On 3 May the staff saw steam plumes at heights of 400-800 m above the crater, which blew W. On 3 and 4 May observations were made at the Refuge and the summit. Staff smelled sulfur halfway to the summit; and found new fumaroles in the Yanasacha area. On 4 May these fumaroles generated white steam plumes up to 50 m above the summit. Fumarole temperatures were 29-31°C. A tectonic earthquake was recorded on 8 May, but although tremor episodes increased, volcano-tectonic earthquakes were fewer during 5-11 May than the previous week. Seismicity continued to drop during the week of 12-18 May. Although some low-amplitude tremor occurred during that interval, activity was dominated by long-period earthquakes. Earthquakes increased slightly the following week, but seismicity remained lower than average for the year. Low-frequency tremor lasting under 10 minutes was recorded on 23 May; tectonic activity on 24 May occurred in the zone of Saquisili and was determined to be unrelated to Cotopaxi. During the final week of May, long-period events and tremor signals increased slightly but seismicity continued to remain within the normal parameters established as of November 2001, when Cotopaxi entered a period of unusual seismic and fumarolic activity. Activity remained generally constant through June, with episodes of harmonic tremor increasing slightly between 9 and 15 June and again on 23 June. White steam plumes reached 300 m high on 4 June, but later they were under 100 m high. At the end of June there was a slight tendency toward deflation; tremor events increased slightly and usually had fundamental frequencies of ~ 1.7 Hz. Between 7 and 13 July the number of long-period events increased, as did the number of hybrid events. However, tremor decreased, and the average number of earthquakes per day (8) was lower than in recent periods of increased activity. The average number of earthquakes per day decreased again the following week. Notable tremor occurred on 20 July, with episodes lasting between 80 and 125 seconds and reduced displacement varying from 0.5 to 11 cm2. During the week of 21-27 July activity increased slightly, from 6.6 to 8.3 events per day, but in general seismic data indicated a state of low activity during July. In early August seismicity rose to an average of 20 events per day, and tremor signals increased, especially on 8-10 August. However, the released energy remained low throughout August. Earthquakes registered that month were generally small, and tremor signals were constant except for two periods of harmonic tremor on 28 August. Although seismicity remained low in early September, on 6 September instruments registered a low-frequency (0.9 Hz), low-amplitude tremor lasting more than 3 hours. On 18 September a cluster of earthquakes (characterized by long-period events and hybrid events) began around 1300 and lasted ~ 4 hours. A second cluster occurred the next day, lasting ~ 6 hours. The earthquakes associated with these clusters were located between 1 and 4 km below the summit. Fumarolic activity was normal for most of September, although a gas discharge was reported on 21 September. After 21 September seismicity returned to normal levels, and continued to decrease through the following week. Seismicity generally remained low for the next few months. Volcano-tectonic earthquakes and tremor increased slightly during 13-19 October. Three distinct episodes of tremor on 15, 17, and 18 October consisted of similar events with dominant frequencies of 0.8-0.9 Hz. Seismicity into November remained low, with no significant episodes of tremor and only small events. By mid-December seismicity increased and although activity remained within normal levels, the occurrence of high-frequency tremor was noteworthy. Also through mid-December, a slight odor of sulfur was reported, as well as occasional columns of steam no higher than 300 m.
Correction: A brown plume mentioned on 7 December 2002 (BGVN 27:12) might be misinterpreted as evidence of an ash-bearing emission. Gorki Ruiz, a colleague of Pete and Patty Hall, clarified events and interpretations from that date. He interviewed guards at the Cotopaxi refugio, who stated that neither they nor others at the refugio that day had observed emissions. They discounted observations of ash emissions and noted that although fumarolic plumes frequently reach 300 m above the summit, no phreatic explosions had occurred. That time interval was also one of low seismicity. Seismicity at Cotopaxi during December 2003 through December 2004 yielded averages that generally remained within normal levels (table 3). Steam emissions continued, and sulfurous odors were occasionally reported. A plot of total seismicity each week during 2001-July 2004 portrayed numerous peaks and valleys in the range 50-200 events per week. Occasional excursions took the weekly totals to several hundred events in late 2001 and early 2002 (peaking at over 700 events per week during mid-October 2001). The 2004 data lacked such dramatic excursions. Table 3. Annual summaries showing typical daily averages of various kinds of seismicity at Cotopaxi during 2001-2004. Courtesy of IG (shown on their website in the January 2005 report). Planning for emergency water supplies. Although seismicity and other monitored parameters were moderate to low during most of 2003 (BGVN28:11 and 28:12), local authorities worked on a contingency plan for emergency drinking water in the event of a crisis at Cotopaxi. The Quito metropolitan sanitation and drinking water company (EMAAP-Q) prepared a contingency plan for residents around Cotopaxi. The challenge was to provide for sufficient amounts of potable and sanitation water for some half a million people in the event of an eruption that contaminates their normal water supplies. This contingency plan was drawn up using experience gained from the operational emergency plan used to recover from the eruption in 1998-99 and the Reventador eruption in 2002. During the Guagua Pichincha eruption, pyroclastic material impacted Quito, and ash fell into the water treatment plants and threatened the water supply systems. EMAAP-Q developed an operational and emergency plan. The plan was tested in 1999 when the volcano had two major eruptions that heat dropped ash on Quito and its infrastructure. Symmetrical, glacier-clad Cotopaxi stratovolcano is Ecuador's most well-known volcano and one of its most active. The steep-sided cone is capped by nested summit craters, the largest of which is about 550 x 800 m in diameter. Deep valleys scoured by lahars radiate from the summit of the andesitic volcano, and large andesitic lava flows extend to its base. The modern conical edifice has been constructed since a major collapse sometime prior to about 5000 years ago. Pyroclastic flows (often confused in historical accounts with lava flows) have accompanied many explosive eruptions, and lahars have frequently devastated adjacent valleys. The most violent historical eruptions took place in 1744, 1768, and 1877. Pyroclastic flows descended all sides of the volcano in 1877, and lahars traveled more than 100 km into the Pacific Ocean and western Amazon basin. The last significant eruption took place in 1904. Barberi F, Coltelli M, Frullani A, Rosi M, Almeida E, 1995. Chronology and dispersal characteristics of recently (last 5000 years) erupted tephra of Cotopaxi (Ecuador): implications for long-term eruptive forecasting. J. Volcanol. Geotherm. Res., 69: 217-239. Hall M L, 1987. Peligros potenciales de las erupciones futuras del volcan Cotopaxi. Rev Politecnica, Quito, 12: 41-80. Hall M, Mothes P, 2008. 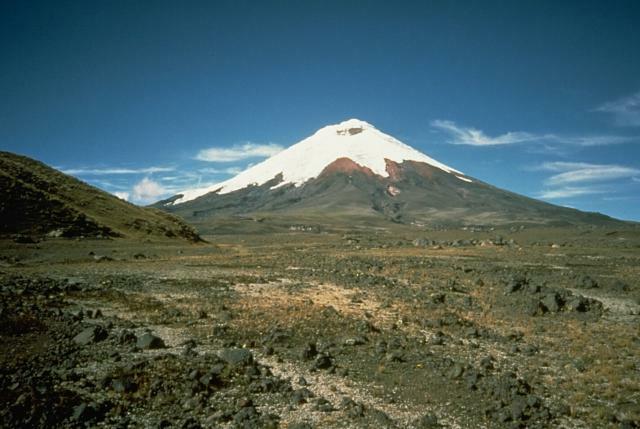 The rhyolitic-andesitic eruptive history of Cotopaxi volcano, Ecuador. Bull Volcanol, 70: 675-702. Hantke G, Parodi I, 1966. Colombia, Ecuador and Peru. Catalog of Active Volcanoes of the World and Solfatara Fields, Rome: IAVCEI, 19: 1-73. Miller C D, Mullineaux D R, Hall M L, 1978. Reconnaissance map of potential volcanic hazards from Cotopaxi volcano, Ecuador. U S Geol Surv Map, I-1072. Mothes P A, Hall M L, Janda R J, 1998. The enormous Chillos Valley Lahar: an ash-flow-generated debris flow from Cotopaxi volcano, Ecuador. Bull Volcanol, 59: 233-244. Mothes P, Hall M L, Andrade D, Samaniego P, Pierson T C, Ruiz A G, Yepes H, 2004. Character, stratigraphy and magnitude of historical lahars of Cotopaxi volcano (Ecuador). Acta Vulc, 16: 85-108. Paulo A, Narebski W, Bakun-Czubarow N, Prochazka K, Wichrowoski Z, 1979. Geology, geochemistry and petrogenesis of volcanics of Cotopaxi (Ecuador). Prace Mineralalogiczne, 61: 1-62. There is data available for 85 Holocene eruptive periods. There is no Deformation History data available for Cotopaxi. 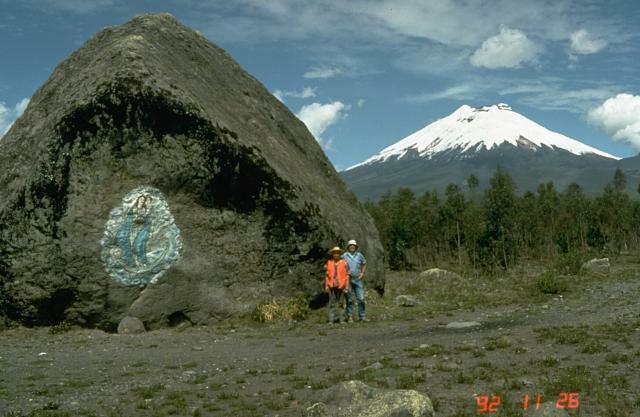 This massive rounded boulder on the SW side of Cotopaxi was carried in a lahar, or volcanic mudflow, possibly during a major eruption in 1877. Scale is provided by volcanologists Minard Hall and Patty Mothes of Ecuador's national university. 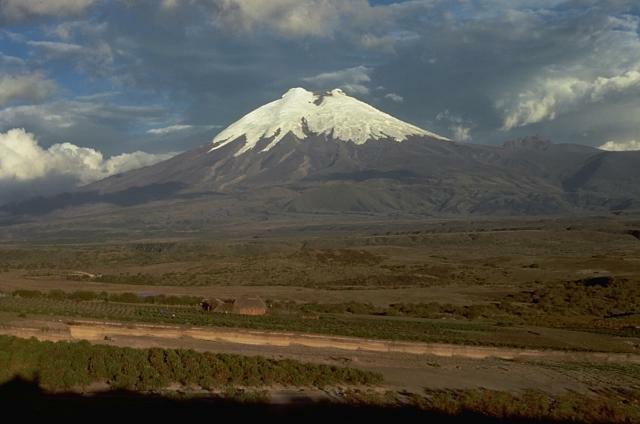 More than 130,000 people live in areas subject to lahar risk from Cotopaxi. The 1877 eruption produced lahars that covered this valley, swept into the Amazon basin, and reached the Pacific Ocean along valleys to the NW. The foreground of this flat valley north of Cotopaxi volcano is the top of the deposit produced by a massive lahar from the volcano in 1877. During this eruption, one of the largest from Cotopaxi during historical time, pyroclastic flows descended all sides of the volcano, creating devastating lahars. The lahar that produced this deposit eventually traveled north down the Guayllabamba River past Quito to reach the Pacific Ocean at Esmeraldas, 225 km NW of Cotopaxi. Mudflows also swept down valleys south and east into the western Amazon basin. Photo by John Ewert, 1987 (U.S. Geological Survey). Symmetrical Cotopaxi is one of the most prominent volcanoes that line both sides of the Interandean valley along Ecuador's "Avenue of Volcanoes." Cotopaxi, one of Ecuador's most active volcanoes, has produced more than 50 eruptions since the 16th century. Glaciers cover the upper part of the cone from 4700 m altitude on the west flank, seen here, to the 5911-m-high summit. Devastating lahars in historical time swept this valley before turning south and then east into the Amazon basin. Lahars to the NW reached the Pacific Ocean. 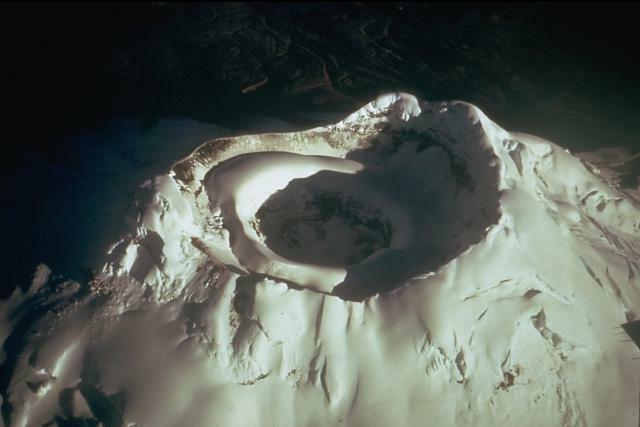 The glacier-capped summit of Ecuador's Cotopaxi volcano is truncated by two nested craters. The outer crater, seen here from the SE, is 800 x 550 m wide. A cone that grew inside this crater is cut by a smaller crater that is 250 m wide and 120 m deep. Frequent explosive eruptions during historical time have modified the shape of the summit crater. In 1903, prior to growth of a broad central cone, it was 450 m deep. Photo by Tom Simkin (Smithsonian Institution). The Global Volcanism Program has no maps available for Cotopaxi. There are no samples for Cotopaxi in the Smithsonian's NMNH Department of Mineral Sciences Rock and Ore collection. Large Eruptions of Cotopaxi Information about large Quaternary eruptions (VEI >= 4) is cataloged in the Large Magnitude Explosive Volcanic Eruptions (LaMEVE) database of the Volcano Global Risk Identification and Analysis Project (VOGRIPA).